Settling at 5.8%, the full-year gross domestic product growth is ‘respectable’ and slightly higher than some analysts’ forecasts. WEAKEST LINK. 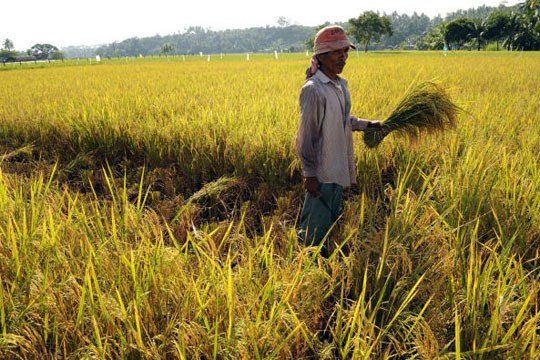 The agriculture sector persists to be the biggest roadblock in our goal of attaining a higher and more inclusive growth, NEDA's Director-General Arsenio M. Balisacan says. MANILA, Philippines – The Philippines’ 2015 economic growth settled at 5.8%, 0.3% lower than the 2014 gross domestic product (GDP) growth, the country’s statistics authority (PSA) reported Thursday, January 28. 2015’s full-year GDP growth was buoyed by the 6.3% expansion registered in the fourth quarter, up 0.2% from the third quarter revised GDP figure of 6.1% (from 6% as earlier reported). GDP, or the measure of goods and services produced across the economy, grew “respectably” given the difficult external environment, the onset of El Niño, and the challenges in government spending in the first semester of last year, National Economic and Development Authority (NEDA) Director-General Arsenio M. Balisacan said Thursday. Earlier this week, multilateral lender International Monetary Fund (IMF) cut the GDP growth of the Philippines to 5.7% from 6% for 2015, attributed to the economic slowdown in China and the normalization of interest rates in the US. And the country’s fourth quarter GDP growth also defied some analysts’ forecasts. Moody’s Analytics said in its recent Asia-Pacific economic review that the Philippine GDP for the last quarter of 2015 would only be 5.9%. “…The growth has not been due to unsustainable borrowing as in the 1970s nor by short-lived portfolio capital. Rather, we see investments in areas that create jobs, increase incomes, and improve people’s wellbeing,” he added, though the government economists conceded that the 5.8% GDP growth for last year was lower than their official growth target of 7% to 8%. It was eventually lowered to a more “realistic” target of 6% given the country’s weak exports and government underspending. Last year’s growth was driven by stronger domestic demand, as government spending accelerated to 9.4% compared to last year’s 1.7%. Growth in public and private investments also doubled to 13% from 5.4%, attributed to public construction, which expanded to 20.6% from 6.3% in 2014. “As these investments get translated into increased employment and incomes, and with record-low inflation, household consumption also grew by 6.2%,” he added. Inflation, or the rate at which the prices of goods and services rise settled at 1.4% in 2015, 0.6% lower than the 2% minimum target of the government. On the supply side, growth remained driven by the services sector, which accelerated to 6.7% in 2015 from 5.9% in 2014. Industry grew by 6%, while agriculture remains a challenge with its 0.2%. Despite the sound fundamentals and ongoing structural changes in the economy that make it more resilient to shocks – as the government keeps harping about, “we can expect higher growth for 2016 as the global economy also picks up,” Balisacan said. And considering the upcoming May 2016 elections, there are remaining challenges that the next administration will continue to confront. For one, the agriculture sector is vulnerable to weather shocks, which, of late, has been more frequent and rather extreme (from El Niño to Yolanda, floods, etc. ), Balisacan said. “The agriculture sector persists to be the biggest roadblock in our goal of attaining a higher and more inclusive growth – both in the light of improving crop production and farmers’ incomes,” Balisacan said and added there is an urgent need to rethink the development strategy for this sector, especially with the impact of El Niño and natural disasters that impact the country yearly. On the other hand, the industry sector is much affected by external demand, which has been weak in all of the past six years. Meanwhile, the services sector demonstrated that it can reach greater heights as more opportunities open for trade in services. “We need to ensure that the policy environment is one that allows easier entry for firms and encourages innovation,” he said. He also pointed out the need for the country to build the socioeconomic resiliency of individuals and communities through multiple strategies like risk mitigation measures, disaster-preparedness, social protection, social insurance, and programs that encourage volunteerism, inter-local government unit interaction, and community building. “Looking ahead, we’re hopeful that the next leaders of this country will sustain the programs and reforms that have gathered significant gains over the years,” he said. Balisacan, who also thanked on Thursday the journalists covering the quarterly GDP press briefings, said the challenge is for the Filipino voters to choose the right leaders who have the integrity and the ability to build strong institutions. “…Credible institutions that can take the economy to an even higher level and significantly uplift the quality of life of the Filipino people,” he said.